For a full list of campgrounds on the Outer Banks, please visit our campgrounds listings page. Nature lovers, budget travelers, and vacationers who just adore the great outdoors often find that camping is an ideal way to tour and explore the Outer Banks. 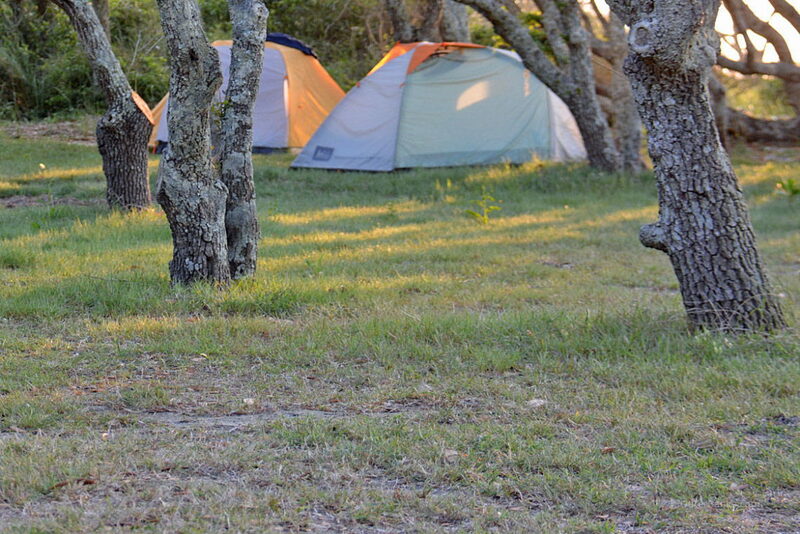 With literally dozens of campgrounds spanning from the Currituck County mainland to Ocracoke Island, camping enthusiasts will find they have plenty of options to choose from. From the small mom and pop campground with just a couple dozen sites to sprawling facilities managed by a renowned national chains or the National Park Service, potential campers can literally choose their own adventure. Saddle up next to the sound in the deep clusters of Live Oaks along the Frisco Woods, pull up the RV to a swinging spot in the heart of Ocracoke Village, or tie up the boat to a dockside camping site in Currituck that has miles of waterfront views. 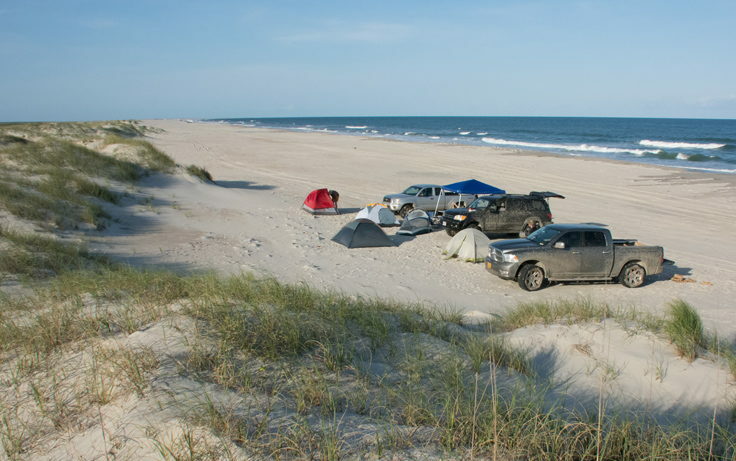 Camping is clearly an easy and inexpensive way to see the Outer Banks, however newcomers to the local camping scene may not be familiar with the options available, the amenities on site, or the reservation process. For answers to your questions, review the following FAQs for extensive Outer Banks camping information. You can also visit local camping websites, or simply call your favorite campgrounds for more information on prices, features, and availability. How do I book a stay at an Outer Banks campground? 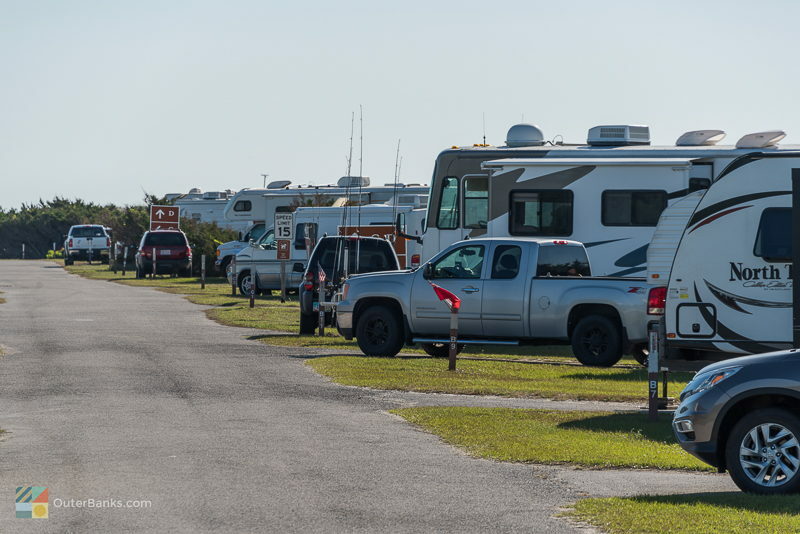 A handful of major campgrounds on the Outer Banks and Inner Banks have comprehensive websites that outlines the individual facility's amenities, fees, and even allows online booking. The National Park Service, for example, which operates five campgrounds from just north of Oregon Inlet to Portsmouth Island, allows internet browsers to check a calendar of availability and book and pay for their camping stay online. While online booking is certainly the easiest method to reserve a site, smaller campgrounds may not have as extensive a web presence, and a phone call may be required to secure a reservation. Luckily, most all campgrounds have trained staff or friendly owners on hand during business hours and on weekends to answer questions, help book reservations, and give their upcoming guests a general overview of their facilities. Before calling or making an online reservation, you should keep in mind any amenities you'll need, (such as electric or cable hook-ups), as well as the desired location of your campsite. 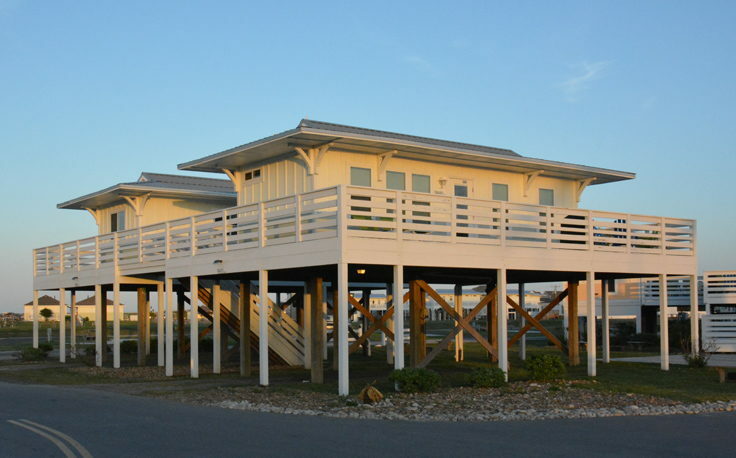 Whether you'd prefer to stay close to common areas and facilities, or on the outskirts of the campground deep in the middle of your natural surroundings, this information is helpful to have beforehand to make sure your Outer Banks camping vacation lives up to your expectations, and then some. When is the best time to book a stay at an Outer Banks campground? The wonderful thing about campsites as opposed to vacation rental homes, Bed and Breakfasts, or even Outer Banks hotels and motels, is that campers can almost always find a spot available to pitch a tent. Camping sites do not fill up as quickly as vacation rental homes or hotel rooms, and as a result, many last-minute campers will find they have options available, even just a day or two away from their expected arrival date. It should be noted, however, that there are exceptions to this general rule of thumb. For example, popular summer long weekends, such as 4th of July weekend, Memorial Day weekend and Labor Day weekend, and generally considered the busiest times of year in the local camping scene, so an advanced reservation may be required, particularly if you have a certain campground or area in mind. Other locales on the Outer Banks that are extremely popular with visitors but provide limited accommodations, specifically Ocracoke or Portsmouth Islands, may also fill up quickly, so keep your desired area in mind before making a reservation. Also, a number of campgrounds, including the Hatteras Island and Ocracoke Island campgrounds operated by the National Park Service, are only open seasonally, and close for the winter months. That said, from April until October, campers will find plenty of options available throughout the Outer Banks, from beachy resort campgrounds to quiet soundside retreats. For a specific campground in a popular location, or during a popular time of year, it's best to book as early as possible. Otherwise, if you feel like a spontaneous last minute camping trip, you'll be happy to find plenty of options available. Where are the Outer Banks campgrounds located? While scattered throughout the islands, many campgrounds on the Outer Banks seem to be concentrated in some of the most pristine and undeveloped areas, from the quiet towns of the Inner Banks to the completely unpopulated Portsmouth Island. Campers will find no problem getting back to nature, while still remaining close to the Outer Banks major attractions, restaurants, and shops, and potential vacationers will find that every area of the coast has its own unique charms. In the northern Outer Banks, many campers flock to the cluster of campground that are located on the Currituck County mainland, about 5-20 miles away from the beaches. Here, the campgrounds are shaded by towering pine trees, and bordered by miles of open Currituck Soundfront. As a result, these campgrounds are supremely quiet and relaxing destinations, literally miles away from the bustle of the beach. Ideal for boaters, many of these campgrounds are located along the Intercoastal Waterway and provide boat slips and hook-ups, as well as tent or RV sites. The central Outer Banks towns of Nags Head, Kill Devil Hills and Kitty Hawk have a small handful of campgrounds that area ideal for RVs or trailers. Though generally on the smaller side, these campgrounds offer incredible access to the beach, (many are located along the "Beach Road" which is basically 1 lot back from the oceanfront), local shops and restaurants, and all the activity of the heart of the Outer Banks. RVs and trailers will also find plenty of amenities, including electric and cable hook-ups, public laundry facilities and snack bars, and friendly local staff who are experts in the area. The small town of Wanchese is another popular retreat for rustic campers, as this little destination is often overlooked by Outer Banks visitors and is located well off the map, and across the Outer Banks / Manteo Causeway. 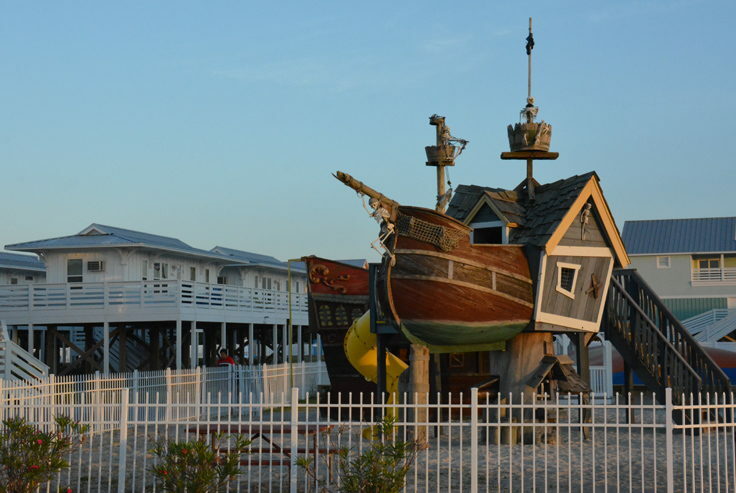 A typical small fishing village, Wanchese offers an authentic Outer Banks atmosphere and plenty of wildlife, ideal for campers who want to enjoy the local culture of the Outer Banks. Hatteras Island is arguably one of the best destinations for campers, as this small island features at least a dozen or so campgrounds to choose from. The National Park Service (NPS) operates three campgrounds along the National Seashore on the island, including one just south of Nags Head, one in Buxton adjacent to the popular Cape Point beach access, and one in Frisco Village, located just steps away from the beach. In addition to the NPS run campgrounds, visitors will find plenty of options in all the island villages. 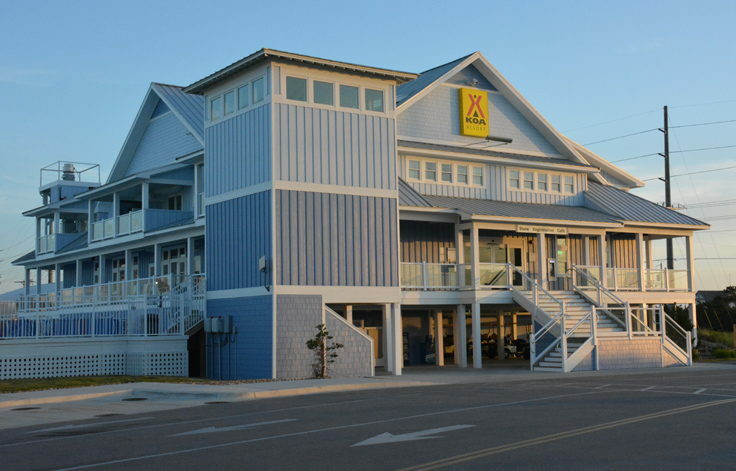 The towns of Rodanthe, Waves and Salvo have the most options available, and even has a nationally renowned chain campground stationed in the village of Waves. The campgrounds here are more reminiscent of resorts, with community pools, private sound accesses and gazebos, club houses and game rooms, and on-site snack bars and stores. Guests can also choose to reserve a standard tent or RV site, or even book a small cabin or rustic rental cottage. With a half dozen campgrounds in the tri-village areas alone, and incredible beach access from every vantage point, these Hatteras Island villages are definitely worth a look by avid campers. Avon and Buxton also have a handful of privately run campgrounds available, and these businesses are small, friendly operations that are tucked away from the main drag of NC Highway 12 in relative seclusion. These campgrounds have friendly local owners who provide plenty of southern hospitality, in addition to community amenities, (like pools or laundry facilities), and are located within walking or driving distance from the beach. The town of Frisco is home to one of the island's favorite campgrounds, which is located adjacent to the Pamlico Sound and offers acres of secluded sites, shrouded by the Frisco Woods maritime forest. With a community pool, on-site general store, and fantastic access for windsurfers, kiteboarders, and kayakers, the Frisco Woods Campground is regularly voted nationally as one of the best camping sites on the East Coast. Keep an eye out for seasonal and annual events, like Windfest, which attracts water sports lovers from all over the world. 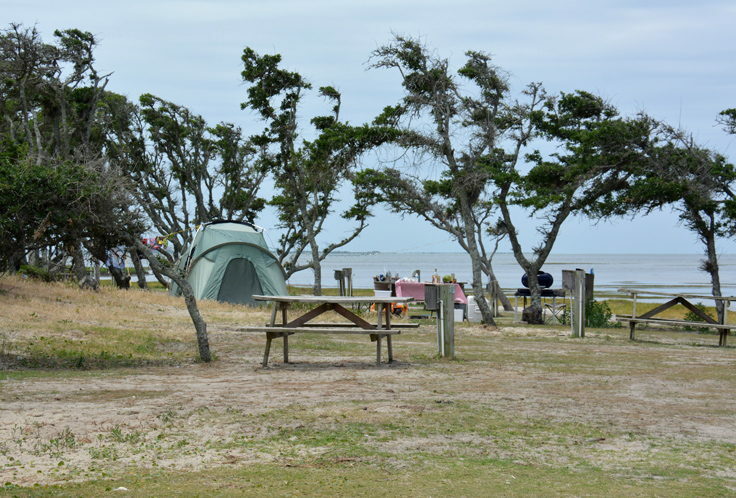 Ocracoke Island is another popular camping location, and the island offers a handful of camping sites both in the village and on the outskirts of town. The National Park Service manages a campground three miles outside the town's borders, adjacent to the sea-oat covered sand dunes, and located just a two minute walk from the oceanfront. In town, Ocracoke lovers will find a handful of privately run campgrounds available, ideal for both tents and RVs. 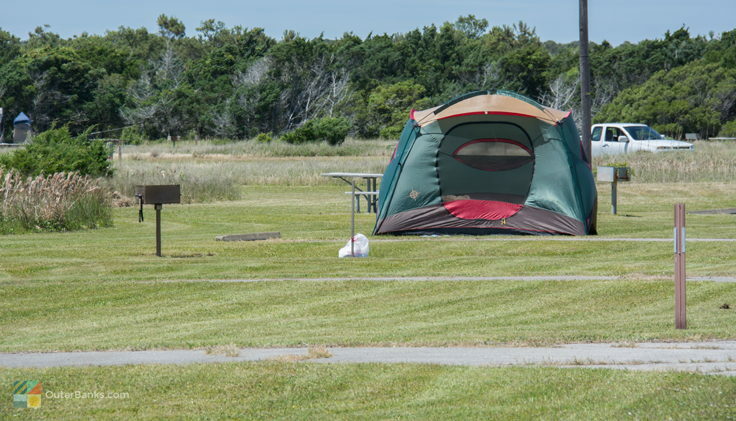 Because of the village's small size, campers will be happy to know that virtually any in-town campground is an easy stroll from all of Ocracoke Village's attractions, restaurants and shops, making these camping sites some of the most convenient and most coveted on the Outer Banks. 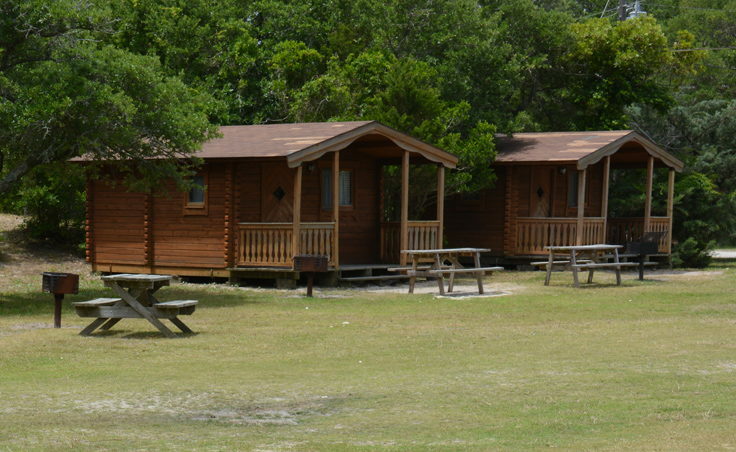 What kind of amenities does an Outer Banks campground offer? New campers may be initially concerned that by renting a campsite, they might miss out on the modern amenities that a vacation rental home or local hotel has to offer, but this isn't always the case. Many larger campgrounds offer public pools, hot tubs, community game rooms, playgrounds, and even on-site grocery stores or restaurants. Virtually, a camper in need of a little extra fun or entertainment can enjoy the perks of a luxury resort vacation, even at a local campground. In addition, most all campgrounds offer the basics, such as electric and water hook-ups, cable hook-ups, laundry facilities, and barbecue grills for every camp site, ideal for nightly coastal cook-outs. Several campgrounds even offer boat slips or additional parking for multiple parties congregating at the same area for a family vacation. Security is also well provided, and the majority of campgrounds either offer gated entrances, or extensive security systems to ensure campers' safety. In short, there's no need to rough it while roughing it on the Outer Banks. Check out the local campgrounds via a visit to their individual website or a phone call to the office, and find the perfect camping site that suits all your vacation needs. Any Tips and Tricks to know before booking a stay at an Outer Banks campground? Be sure and consider the off-season, especially for spur-of-the-moment vacations, or tent camping trips. The summers on the Outer Banks can be notoriously heavy with mosquitos, and an off-season camping trip in the fall or spring months can provide bug-free stays, and cool ocean breezes. The ocean water temperatures on the Outer Banks generally stay warm well into early October, so campers don't have to worry about missing out on sunny beach days. In addition, site fees are generally slightly less during the off-season months, making a budget-friendly camping vacation even friendlier. Bring your boat along! 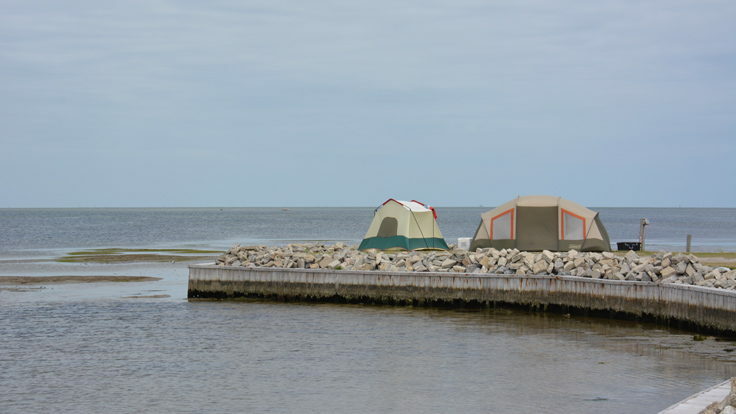 Several campgrounds along the Outer Banks, particularly in the mainland areas of Currituck County, feature boat slips for mariners passing through in need of a good night's rest. These campgrounds also feature gas, electric and cable hook-ups, and even on-site ship's stores and restaurants for a conveniently enjoyable vacation right off the docks. Ready to grill out? Most all campgrounds offer individual park or charcoal grills for every site, but just because you're camping doesn't mean you have to stick to the standard hot dogs, beans, and s'mores. To truly grill out Outer Banks style, stop by a local fish market and pick up a couple of fresh fish filets, a pound of shrimp, or a bushel of oysters. Locals attest that seafood always tastes better on the grill, and the wide variety of options available gives camping and barbecue enthusiasts plenty of options to explore. While a last-minute camping adventure is certainly within reach, for the best locations, it's best to reserve as early as possible. Many campgrounds have extremely flexible cancellation policies, so rescheduling a camping trip is always a breeze. Ready for a true adventure? Head to Portsmouth Island. This tiny island is a camper's paradise, as virtually any area from the beachfront to the soundside can be a makeshift camping location. A small, sandy path runs behind the dune line, ideal for waterfront sunset-lovers to explore in search of that perfect secluded location. Be advised that the private ferry in the town of Atlantic only operates from early spring until Thanksgiving, and can only accommodate about 4-6 vehicles per trip, so booking your ferry reservations early is key. Camping may seem like the most budget-friendly way to vacation on the Outer Banks, and it is, but local campers will enjoy so much more out of an OBX camping experience than just cheap and convenient accommodations. Nothing beats getting back to nature tucked along the oceanside sand dunes or soundside forests, enjoying a canopy of stars on warm summer evenings, or just reconnecting with the family over a home cooked seafood feast on the grill. For an Outer Banks vacation that you'll truly treasure, while allowing you to fully enjoy the very best of the natural coastal landscape, plan an Outer Banks camping trip for your next beach vacation, and then sit back, relax, and enjoy the scenery. The Village Table & Tavern is Duck’s newest casual waterfront dining destination. We have something for everyone to enjoy, from inspired sandwich combinations to expertly prepared local seafood with a kick of creativity. In addition to our approachable menu for all ages, we serve local and international craft beers, an exceptional selection of wines, and craft cocktails that will leave you wanting more. The drive to your Outer Banks destination can and should be part of the fun of heading to the beach, and with the wealth of roadside attractions, iconic destinations, and hidden gems, it’s easy to transform a long drive into an integral part of your getaway. So instead of making a beeline to the beach, take some time to check out the variety of activities and sites that are found along both the main routes and just slightly off the beaten path. Whether you come to the Outer Banks from the north, south, or west, you’ll find that there’s tons to discover along the way.